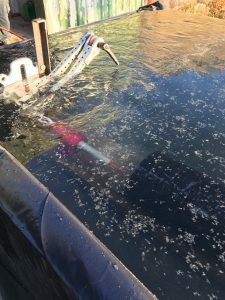 Hydroblast was recently contacted by a company in the nuclear Industry for help with cleaning out a section of pipe so they could reuse it in the future. They had used one of the Steve Vick bags. This permanent flow-stopping system uses expanding bags by injecting expanding Polyurethane resin foam into a semi-porous bag. 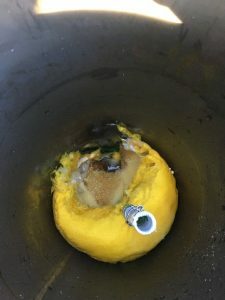 Once the foam has expanded to the bag’s limit, some of the resin will seep through the material, sticking the bag securely to the side of the pipe. It also means that once they have been deployed, they can be extremely hard to remove. Making this case more complex was the fact the pipe was underwater, and the client did not want to remove it. Following the assessment job, we initially decided to use one of our more routine methods for unblocking pipes; our UHP pumps. These pumps can apply pressures of up to 3000 bar and have been consistently effective when removing debris and pipe cleaning to the high standards that we achieve. This method, however, had never been used underwater. We found that although it removed the foam, the reaction force of the jets was massively reduced due to the surrounding water. This resulted in a large section of the pipe still containing solidified debris on the sides of the pipe, remained. The company was potentially looking at a hugely expensive solution with no guarantee of success before Hydroblast made an innovative proposal to the client with a new product: the Hydro Twist Nozzle. As the pipe was underwater, there was a need for a highly concentrated jet of water with an intensity that would not be diminished by the surrounding water. The Hydro Twist is one of the newest tools in our range of pipe cleaning equipment. It works at pressures of up to 1200 bar and navigates bends to remove all kinds of debris and deposits. The high-pressure jet is run through a feeder unit into the pipe then, rotated with an air powered swivel, the fixed jet-powered nozzle will supply water at very high pressures. The pressure of the water means it can clean hard-to-reach areas and saves on costs and time by cleaning whole sections of pipes in one session. As water jetting can be extremely dangerous, the safety of our operators is paramount. The design and development of equipment by Hydroblast was created with this in mind. The Hydro Twist was deployed so the operator can adjust the rotation and forward speed remotely, meaning operators were not required to control the machinery during jetting. 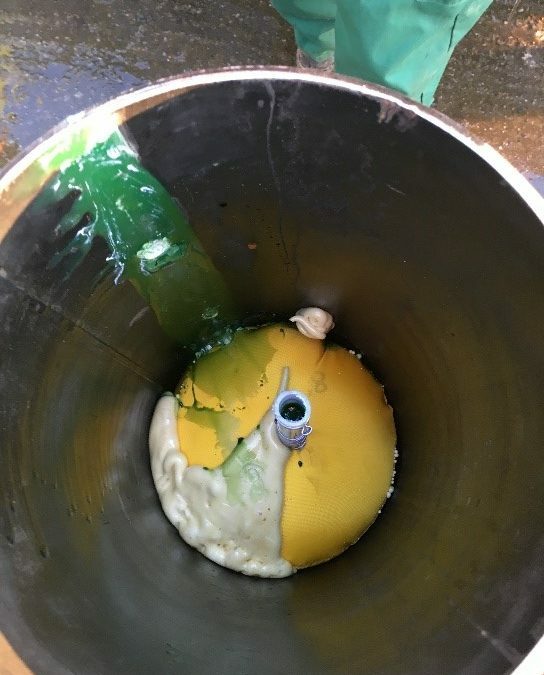 The client agreed that this new equipment could be used to clear the remaining debris that the bag had left on the sides of the pipe, given that all other options had been exhausted. In order to demonstrate the effectiveness of the equipment, a trial was undertaken and a section of pipe was transported back to our Headquarters. This innovative approach worked perfectly – our client was able to reuse the section of pipe. The client was absolutely delighted with this new and innovative method and the outstanding results. Here at Hydroblast we specialise in industrial cleaning, demolition, concrete cutting and much more. We are proactive and develop new and innovative solutions to any problems you may have in these areas. If you have any queries or would like to learn more please visit our website. Hydroblast has a range of nozzles and equipment that are available to buy or rent, both short term and long-term rentals available. Contact us today if you are interested and we will be more than happy to help.